I can't believe it. 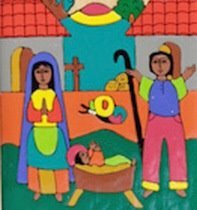 In a move that came in a surprise to most in El Salvador, the Catholic church in San Salvador is removing the famous tile mural of artist Fernando Llort from the facade of the Metropolitan Cathedral. With little fanfare, the church is destroying an important national artistic treasure. The destruction of the mural has been condemned by the Salvadoran government and by the family of Fernando Llort. The family of Llort says the artist is deeply saddened, and that he had not been advised in advance nor given the opportunity to retire his most important artistic work in dignity. The mural, completed in 1997, was an homage to the 1992 Peace Accords which ended El Salvador's civil war. Record number of murders - but why? The close of 2011 in El Salvador is dominated by a single statistic. There were more murders this year than in any other year since the signing of the 1992 peace accords. 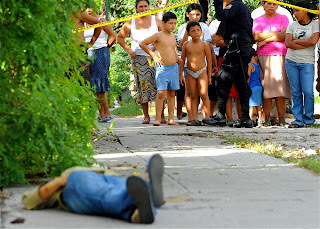 According to police statistics, through Christmas Day there has been 4308 homicides in El Salvador, topping the prior post-war high of 4233 in 2009. The murder tally in 2011 represented a 9.3% increase over the year before. It leaves El Salvador with one of the highest murder rates in the world, 65 per 100,000 inhabitants, perhaps surpassed only by its neighbor Honduras. Mike at Central America Politics blog has a detailed look at the murder rate over the past several years. As reported in El Faro, the National Police (PNC) are blaming part of the increase on the growing influence of drug-trafficking in the country, including the sale of drugs locally on the streets. Christmas Day, 1977 From quotations of Oscar Romero collected in The Violence of Love. 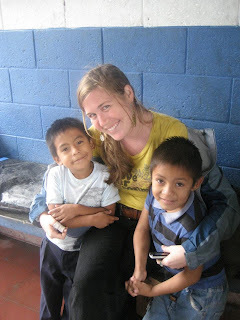 The Peace Corps has cancelled its January 2012 volunteer training classes for El Salvador and Guatemala. Due to ongoing security concerns, the agency is enhancing operational support to currently serving volunteers in these countries. All currently serving volunteers in El Salvador and Guatemala are safe and accounted for. The Peace Corps will continue to closely monitor and assess the safety and security climate and enhance volunteer support in these countries. There is a health crisis in El Salvador and other Central American countries which has been greatly under-reported. Chronic kidney disease is killing thousands in the region, and the causes are not known. At a regional health conference in February 2011, El Salvador's Health Minister Dr. María Isabel Rodríguez spoke of an epidemic of chronic kidney disease afflicting the country, where kidney disease is now the leading cause of hospital deaths for men aged 20 to 60 and the third leading cause of death for women. One in four men living in coastal areas has the disease. 65% of Salvadorans believe that crime is the biggest problem facing the country, while 30% believe the biggest problem is the economy. 76% believe crime increased in the past year. 22.5% of Salvadorans said they had been the direct victim of a crime in the past 12 months. Civil society organizations and bloggers may be concerned about the increasing use of armed troops on El Salvador's streets, but it remains politically popular. Although they believe that crime worsened this year, 59% of Salvadorans say that the presence of troops in the streets is contributing to reduce crime some or a a lot. I've been writing Tim's El Salvador Blog for more than 7 years now. I've tried to make it a reliable English language source of information about some of what goes on in El Salvador, and from the feedback I have gotten many of my readers think I have at least party succeeded. From time to time, people ask me what they can do to support the blog. since it's free and (so far) I don't accept any advertising. The answer is nothing -- this is my contribution to raising the level of awareness about El Salvador for English-speakers around the world. El Salvador's National Assembly Wednesday passed a progressive income tax system proposed by president Mauricio Funes. The vote was 66 to 17 in favor of the bill, with all deputies in the National Assembly voting in favor of the bill other than members of the right wing ARENA party. Under the bill, a Salvadoran making $500 or less per month will pay no income tax. Those between $500 and $6200 will pay 25%, which is the current rate. Those who make more than $6200, will pay 30%. In addition, income taxes on businesses were raised to make sure they were paying taxes into the system. Mari Carmen Aponte's recess appointment as US Ambassador to El Salvador expires at the end of the year unless her nomination is confirmed by the US Senate. There is a possible test vote today to see if Republicans have the votes to block the nomination with a filibuster. Roll Call has a good overview of the debate. This weekend, people from throughout El Salvador and the world gathered in a remote location in northeastern El Salvador to commemorate the 30th anniversary of the El Mozote massacre. 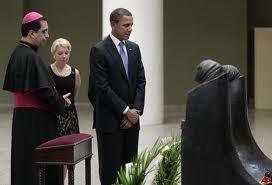 It was a time to remember and a time for renewed commitment to the quest for justice for the victims. This year, the commemoration commenced on Saturday, December 10, which is the 63rd anniversary of the adoption of the Universal Declaration of Human Rights. Anniversaries bring infrastructure improvements to El Mozote. There was fresh asphalt pavement on the last few hundred yards into the village. A grader smoothed a hill side to make parking spaces for cars, just as the cars started to pull in. A raised stage had been raised close to the little church on the main plaza in El Mozote. The whole plaza was filled with hundreds of people. Vendors sold artisan items, T-shirts, and pupusas. This list of the names of the victims was initially compiled by Tutela Legal, a church-run human rights group in El Salvador, and updated by Mark Danner, author of The Massacre at El Mozote, records the ages and professions of 767 people who were murdered by the U.S.-trained Atlacatl Battalion. (Source). The name "El Mozote" will forever be linked with a massacre and some of the most unimaginable cruelty inflicted by one set of human beings on another. 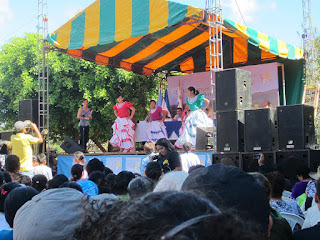 But El Mozote is also the name of a community where people today live, dream, and struggle to support their families. El Mozote was a deserted, ghost town at the end of the civil war, but some of its former residents who were not present on the day of the massacre have returned. Without ever forgetting the past, hope is being reborn. In a town where so many children are buried, children now paint images of life and hope. President of the Republic, Mauricio Funes, revealed [December 5] that on the coming 16th, during a ceremony commemorating the 20th anniversary of the Peace Accords, he will present a set of collective reparations for victims of gross violations to human rights. The President revealed this initiative today at a meeting behind closed doors, he had with family members and representatives of organizations that were formed after the slaughter at El Mozote.